Understanding information reporting using the 1099 series of returns is crucial for the practitioner. Not only are there penalties for failure to file and inaccurate filing, the IRS uses these information returns in its document matching program to identify problems on Form 1040 and other tax returns. 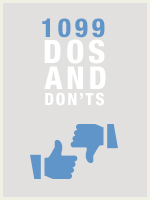 Unfortunately, winding your way through the maze of 17 different 1099 varieties can be a challenging task. This course is designed to provide needed guidance through the thicket. General rules involving the 1099 series of information returns are discussed, including due dates, penalties, and the proper procedure for correcting errors. In addition, each of the 17 Form 1099 types is reviewed, with special emphasis on Form 1099-MISC, the most common of the information returns.